Included Crystal – A mineral crystal (many times it’s another diamond, but it could also be one of many different minerals) contained inside of a diamond. Crystals can be almost any size, colored or colorless, and can occur alone or in groups. Dark included crystals are often called “carbon spots” or just “carbon”, but it’s an incorrect term when referring to these diamond inclusions. 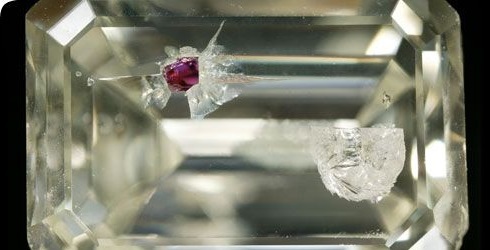 Here is a link to a diamond inclusion photo which shows a crystal of garnet that got caught up in the diamond’s growth along with a dark included crystal. Needle – Long, thin crystal that look like a tiny rod… it can appear white, bright, or dark. Pinpoint – A very small included crystal that looks like a tiny dot. Cloud – A group pinpoints…. looks like wispy white or gray patch. Some clouds look like a light haze, while others are dense and almost impossible to see through. Twinning Wisp – A series of pinpoints or clouds that appear flat and ribbon-like. 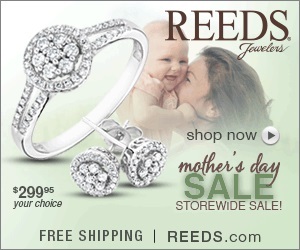 Twinning is a result of the crystal growth direction shifting as the diamond is growing in the earth. These pinpoint crystals orientate along the resulting twinning plane. Internal Graining – Internal graining is also caused by a shift in crystal growth. Its appearance can take the form of lines, angles, or curves, and it might be whitish, colored, or reflective. Feather– A feather is a nice term for any break in a diamond. Having a “feather” inside of your diamond sounds a lot better than your diamond having a crack!…. making diamond inclusions sound fun! Bearded Girdle – A bearded girdle consists of minute feathers that extend from the girdle surface into the stone. 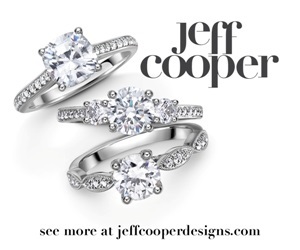 This is a result of shaping the diamond during the cutting process. Bruise – A bruise is a tiny area of impact accompanied by small root-like feathers. A bruise is sometimes called a percussion mark and is cause by a hard blow. Knot – A knot is an included diamond crystal that extends up to the surface. With magnification and proper lighting, you can see the boundary between a knot and its host diamond. Chip – A chip is a shallow opening on the surface that is the result of damage that occurs after cutting. Cavity – A cavity is the space left when a surface-reaching crystal drops out or is forced out during polishing. Indented Natural – An indented natural is a portion of the original rough diamond crystal surface, or skin, that dips below the polished diamond’s surface. The original surface of the diamond’s skin might have growth markings that look like triangles (called trigons) or parallel grooves. Laser Drill Hole – The laser drill hole is a tiny tunnel produced by a laser beam. The tunnel extends from the surface to what was a dark included crystal. 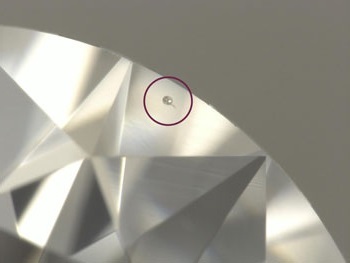 GIA’s Gem Trade Lab will issue a diamond grading report on diamonds that have laser drill holes because the holes are permanent features and notes the laser drill holes under the comments area. Fracture Filled – Laser drill holes and surface-reaching feathers are sometimes filled with a molten glass type substance in a clarity enhancement treatment called fracture filling. GIA’s Gem Trade Lab does not issue diamond grading reports for fracture filled diamonds because the treatment is not permanent.